As you remember, we've already visited Warrnambool: last time we went to Allansford Cheese Factory and Hopkins Falls. In August 2013 we went to Warrnambool again to watch whales! 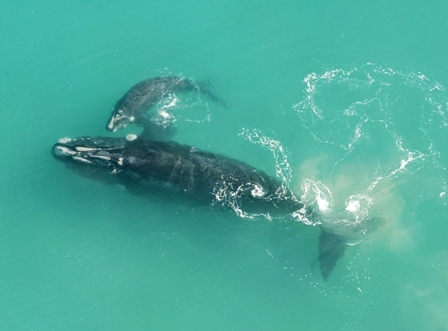 Each year, roughly between late May and early October, Southern Right Whales return to their nursery at Logan's Beach near Warrnambool to give birth and raise their calves. Just offshore, in clear view, the giant, gentle mothers and their giant children loll about and play, enjoying the shelter of Lady Bay. The Logans Beach Whale Viewing Platforms is just to the east of the city, overlooking the whales favourite playground. It's open at all hours and is free. The Southern Right Whale can be recognised by its smooth, black back and lack of dorsal fin. On the head of each Southern Right Whale are a number of crusty outgrowths called callosities. The callosities pattern varies from whale to whale. Irregular white patches sometimes found on the whale’s belly distinguish these animals from other species. Once we arrived at Logans Beach, we spotted a whale with its calf! Then another one! Please see two black spots in the middle of the photo - it is a mother and her calf. Two other spots on your right are swimmers. You can also see a part of a beach and imagine how close the whales are! We spotted 3 or 4 mothers at the same day there. Everyone was happy as animals were so close to us! Hope that next time I will take binoculars (or buy new lens for my camera:) to see them closer. Please note that sometimes whales are not there, so always check Facebook page, Visit Warrnambool website before going to Logans Beach. Take binoculars or a telescope and be prepared for windy or wet conditions. After a while we went to Warrnambool to take ashort break before moving further to Tower Hill Wildlife Reserve. We had a lunch near Lake Pertobe Adventure Playground. This place is great for kids (see photo below).